This 500 piece puzzle is sure to turn out to be a masterpiece! Based on Jan Styka’s The Crucifixion painting. Completed size is 36″ x 12″. A remarkable story of an equally remarkable artwork awaits the visitor to Forest Lawn’s Hall of the Crucifixion. 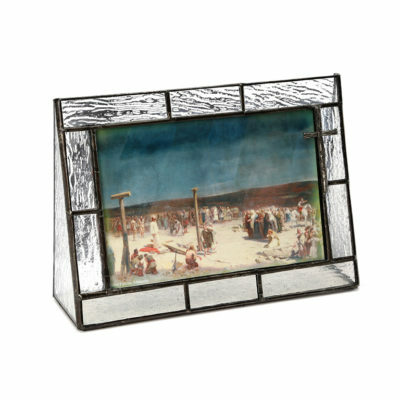 Herein is housed a massive framed and mounted painting on canvas, the masterwork of Polish artist Jan Styka (1858-1925). 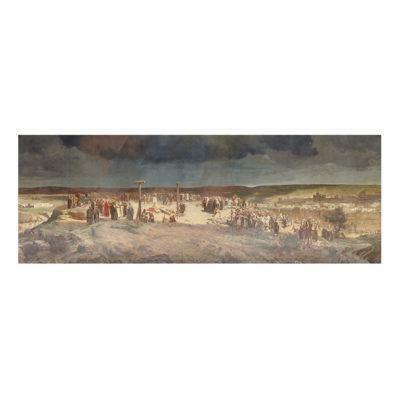 The painting had been rescued from oblivion by Dr. Eaton in his quest to find a depiction of the Crucifixion matching his uplifting vision of the event. Styka’s panoramic Crucifixion shows viewers Jerusalem as if they were overlooking the city from the surrounding hills. 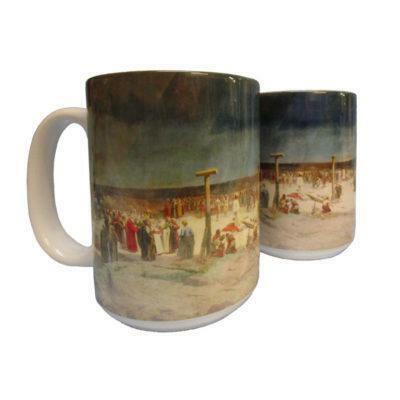 It is a vast panorama of that moment in history when Jesus was about to be nailed to the cross. Jesus stands in the center of the canvas, bathed in supernatural light while glancing heavenward in acceptance of the imminent sacrifice. But it is a victorious Christ about to fulfill a holy mission, not a tragic image of the crucified Christ. To present his preferred narrative to the public, Dr. Eaton created a 900-seat auditorium in 1950 where guests are shown a documentary film about the painting—now transferred to video—before the massive curtains part to reveal the actual canvas. The painting’s amazing trajectory is well explained in the documentary. Commissioned to do the painting in 1894, Styka made an inspirational trip to Jerusalem, where the pope blessed his palette. The painting wasn’t completed until 1904, when it went to the World’s Fair in St. Louis but proved too large to be installed there. Abandoned by the artist in the United States, it was eventually re-discovered by Dr. Eaton, who saw how the composition could enhance—and itself be enhanced by – the context of Forest Lawn. The visual impact of the enormous scene unfolding before the viewers, dramatically lit within an otherwise completely darkened auditorium, is pure spectacle. The moment is brought to life in a cinematic way, fitting for the time (1950s) and place (Los Angeles) in which it was first being presented. At the time that it was first unveiled, the painting and its story helped to make Forest Lawn the number one tourist destination in Los Angeles. 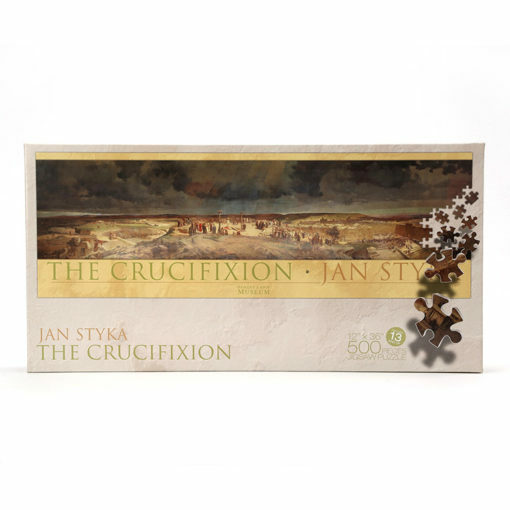 As a magnificent artwork, a fascinating story and a cultural jewel, Styka’s Crucifixion continues to be “worth a trip,” as the Guide Michelin would say of a top destination.